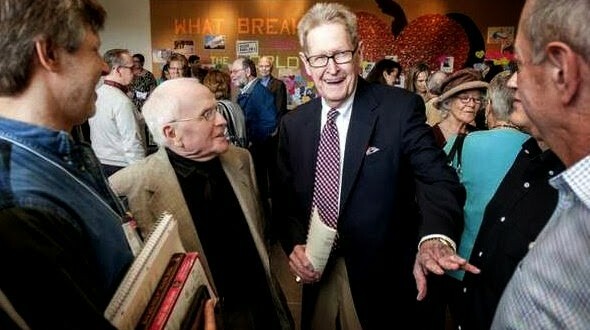 TEXAS: Gay Couple Marries In United Methodist Church After 53 Years Together - Joe.My.God. It was a wedding 53 years in the making. Jack Evans and George Harris made their relationship official in the eyes of at least one church. “The marriage of George and Jack is a sign of God’s love and their love for each other and our love for one another,” said Rev. Bill McElvaney, the minister officiating the marriage. Evans and Harris are in their 80’s. They asked several churches to perform the ceremony. Northaven United Methodist Church in North Dallas was the first to say yes. “We’re celebrating 53 years and finally saying let’s make this… let’s call it what it is… what it has been for a half a century,” said minister Arthur Stewart. Hundreds of people witnessed the ceremony.